I brought today’s topic up as a question the other day on a couple of social media platforms, but I’ve recently been considering the nighttime spectaculars across the parks. Questioning which ones work, which don’t, which need some attention, and just what would some of these revamped shows look like? There are also parks, like Disney’s Hollywood Studios, that have more than one show in the evenings to consider when looking at the nighttime offerings as a whole. Today, as a fun exercise, I’m going to pick one offering from each park and offer up my thoughts about where it is and what, if anything, could make it better. I’m going to go out on a limb first and talk about a show that I’ve only seen in videos so far. This show is also the newest of the evening shows, which means it should be in good shape for a few years. The projections, while rapidly becoming a common element in twilight shows everywhere, are state of the art and even brought in animators to create new scenes for long established characters. The fireworks are impressive and it boasts an impressive runtime. I’ll reserve any final judgment for after I’ve seen the show in person. 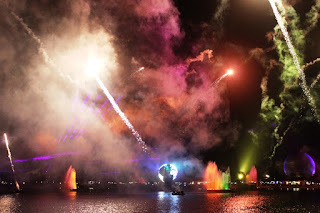 IllumiNations, in name, has been around for 30 years now with the current version having been occupying the lagoon for the better part of 20 years. It has the greatest viewing area of any current nighttime show, wonderful music, and a touching message. It does, however, need some refreshing. New firework shells and some new technology would go a long way, and a new centerpiece should also be worked into the mix. I love the message of the current show, but an updated soundtrack would also be appreciated. The original version of IllumiNations utilized music from the countries represented, but I don’t want to go back down that route, but maybe using musical cues or native instruments would be a great way to work all of that in. I think, of all the shows we’re talking about today, this is the one that will see a complete reimagining within the next couple of years. Disney’s Hollywood Studios – Fantasmic! I was watching the newly refurbished Fantasmic! at Disneyland and realized just how much TLC the version at Disney’s Hollywood Studios needs. For starters, the Pocahontas story elements need to go, maybe add in a La Llorona sequence from Coco or How Far I’ll Go from Moana, give it something new and beloved that taps into children watching the show. Also, the Studios’ Maleficent dragon has never matched up to Disneyland’s, so why not scrap that character all together or demote her to the water screens only? Instead, turn the top of the mountain set into a true Audio-Animatronics marvel, Chernabog from Fantasia. Add in some of the beloved projection technology, upgrade the water screens, and you would have a show that would be the talk of Hollywood once again. I absolutely love this show to the point that I wished it were longer. 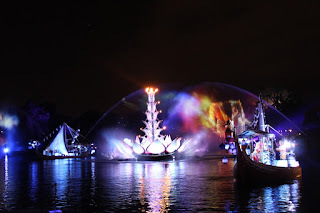 However, I also know that I’ve seen it from the perfect spot on multiple occasions now, and that not all views are alike when it comes to Rivers of Light. I’m not saying that guests on the bridge or walkways around DinoLand U.S.A. and Asia should be wonderful, but everyone inside the amphitheaters should have a clear view. I can’t imagine any fiddling with this show would be easy, but it is what needs to happen to make certain everyone has an equal view of all the storytelling elements. There you have it; some thoughts on overhauls, touch-ups, and things that should probably be left well-enough alone! I’m not going to rank each of these shows in my personal list, because I’m wise enough to know that on any given day that could completely change depending on where I am and what I’m feeling. However, I do know that a day at Walt Disney World is not complete without one of these nighttime spectaculars, so they should definitely be putting their best foot forward.